1. When did you first start working in the motorcycle industry? I first started properly working in the industry in 1982, but I had already been riding and working on bikes for a few years before that. 2. What initially sparked your interest in racing? I always liked pushing the limits and making things go faster. It just naturally progressed into racing from that. 3. Are you as passionate about racing now as you were when you first began your career? There have been so many really. I suppose David Jefferies' 1999 Formula 1 TT win is one that stands out for me. Bringing the Triumph brand back into racing after 28 years and winning the 2003 Supersport TT - including the manufacturer award - was also a highlight. My current job as Team Manager for Carl Fogarty's FPR team is one of the most difficult projects that I've ever been involved with and so that's also a highlight. 5. Is there any particular low point that stands out? There's only one that I can think of, but I don't like to drag things up from the past. If I ever write a book I'll spill the beans then! 6. Do you find winning and losing races as emotional as the rider does? 7. Who is the best rider that you have ever worked with and why? I have been fortunate to work with many good riders, but Jim Moodie and Steve Martin stand out purely for their professionalism and racing focus. David Jefferies was a natural rider and all-round nice guy and then there's Craig Jones. He's professional at just 21 years of age and I think he will go a long way. 8. From a team manager's perspective, are there any major differences between the various motorcycle racing championships in terms of the work involved? No, I don't think so. It's still down to being well organised and building a team of competent like-minded people around you. 9. Is it possible to win races on non-factory machinery in today's racing championships? I believe it is, particularly in the World Superbike Championship. That's part of the appeal that the series has. Its philosophy is that you can buy a motorcycle from your local showroom, modify it and then go racing. Obviously you need a talented rider like Bayliss or Toseland to be able to win though. 10. Do you have any ambitions left to fulfil? Yes, I've got loads to be honest. 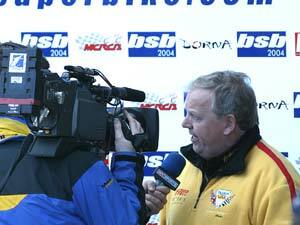 I would love to manage a team to win the World Superbike Championship. 11. What would your advice be to anybody trying to break into a career in the industry? I would say initially forget about salaries and how much you can earn. Just get stuck in, work hard, show confidence and use your initiative. Most of all, work with a passion for your job and try to become a team player rather than an individual within a team. 12. How would you describe your management style? Hands-on! I like to be in the thick of everything as it's happening. 13. Is it difficult to be hard on riders who are under-performing when you know that they are already berating themselves? It's not hard if they are showing no motivation when they are racing and they are on a competitive bike, but it's difficult if the bike is at fault. 14. As a team manager do you tend to get forgotten in times of victory or do you prefer to let the rider take the glory? The rider takes the initial glory and then the team. Without the correct management and team there would be no glory, no matter how good the rider is. 15. If you could do any other job at all, what would it be? I would probably be a professional golfer - that seems nice and easy. Just play golf all day in the sun, get paid to do it and still be taking part when I'm in my seventies!